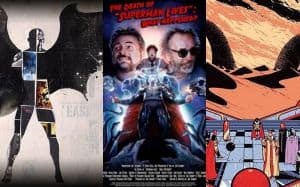 10 Best Pop Culture Documentaries for Nerds | Nerd Much? While we love a good documentary movie that opens our eyes about a social issue, or a certain way of life that we’re not knowledgeable about, they don’t all have to be life-changing. There are plenty of pop culture documentaries out there to fit our nerdy needs. I mean, saving whales is important, sure, but what about the reason that Nic Cage Superman movie failed? Why doesn’t anyone care about that? (They do). Getting a behind the scenes look at pop culture is a great way to learn without cracking a book. But with the never-ending scroll of Netflix documentaries (some of which made it onto this list), there are some two-hour wastes of your time in there. While we’re all about wasting your time, we don’t want you to sit through those duds. Frank Herbert’s Dune is one of the best sci-fi novels of all time, but what if cult filmmaker and Mexican comic book writer Alejandro Jodorowsky adapted it for the big screen? Well, his adaptation never made it out of the gate, but Jodorowsky’s Dune gives us a look at what might have been. It’s being called one of the greatest science fiction movies never made, and it’s a spellbinding look at what we could’ve had. The Death of ‘Superman Lives’: What Happened? is a 2015 documentary film by Jon Schnepp. It chronicles the events surrounding the cancelled Tim Burton film Superman Lives that would have starred Nicolas Cage as Superman. The film was cancelled just two weeks before its filming was set to begin, and the documentary shows artwork and designs that would have been used in the movie. Everything or Nothing: The Untold Story of 007 is an interesting history of the Bond franchise. It includes the triumphs of bringing James Bond from books to the movies, and it’s filled with great stories revolving around Bond and creator Ian Flemming that you probably haven’t heard before. It’s an absolute must for James Bond fans. If there’s one nerdy documentary film you must watch on this list, it’s Indie Game: The Movie. It gives a brilliant and telling look into the lives of three now very well-known indie developers and what it took for them to release their game. It follows Super Meat Boy developers Edmund McMillen and Tommy Refenes, Fez developer Phil Fish, and Braid creator Jonathan Blow. The directors captured over 300 hours of footage containing interviews and development footage, but they elected to feature just these indie devs. Hopefully, we’ll get to see some of the rest of the footage at some point. He’s the man responsible for taking Marvel Comics to the giant conglomerate that it is now. With Great Power: The Stan Lee Story details the life and career of comic book writer and editor Stan Lee. He’s the co-creator of some of the biggest superhero names in comic books, including Spider-Man, Hulk, Fantastic Four, X-men, Iron Man, and over 200 other characters. The documentary features commentary and stories from big names in the business, including Avi Arad, Ian Bryce, Nicolas Cage and more. Nightmares in Red, White and Blue is a fascinating and entertaining look at the American horror film genre and its evolution, with a focus on its connection to events in the U.S. The film interviews such horror icons and historians as John Carpenter, George A. Romero, and Tom McLoughlin to get their opinions on the relationship between historical events and horror movies. It starts with the connections between World War I and iconic horror movies like Dracula, Frankenstein, and The Seventh Victim, and goes all the way up to the realistic themes of serial killing expressed in movies like The Silence of The Lambs, Se7en, and the Saw movies. The documentary has a great way of making you think out of the box when it comes to horror themes. There’s a lot of truly weird stuff that goes on in Doctor Who, which is why BBC strung together this TV documentary looking at the real science behind the sci-fi show through a lecture by physicist Brian Cox. Cox delves into the nature of black holes, time dilation, time as a dimension for travel and the possibilities of alien life. It includes the 11th doctor Matt Smith. Calvin & Hobbes is a classic newspaper comic strip that ran from 1985-1995 that gave us a look through the eyes of a young trouble-making lad (Calvin) and his stuffed animal friend (Hobbes) who became a real tiger when alone with Calvin. The strip is cleverly written, and the documentary — although it doesn’t contain any participation from creator Bill Watterson — is well worth the watch. If Legends of the Knight doesn’t warm your heart, your heart simply isn’t real. The documentary is about the influence of Batman in society, following Batman’s belief that one man can make a difference and the power one man has. While many books and documentaries have taken a look at the origin of Batman and his stories, Legends of the Knight delves into the lives of people inspired by Batman to be a positive force for change. It tugs at the heart strings.